As a reader, some books are inevitable. They haunt your days; appearing in bookshop window displays, in people’s hands on trains, or in review section round-ups of the books the literary world wants the rest of us to know it has been reading. One day you will read the book that’s been nagging at you and when you do open the first page, then turn the next and the next, and on and on as you are drawn in, you’ll wonder what took you so long. Recently this happened to me as I finally got around to reading Patrick Leigh Fermor’s A Time of Gifts and as I plunged in, it felt like meeting an old friend. For years, via an early-twenties obsession with Bruce Chatwin and a long-standing liking for books involving long walks – such as Laurie Lee’s I walked out one midsummer morning, I had been dimly aware of Leigh Fermor’s work and had the feeling that I might enjoy it. I remember handling paperback copies and noticing John Craxton’s cover illustrations on several occasions over the years since at least the 1980s, when helping-out in my Mum’s bookshop in Bristol and later working in The Gloucester Road Bookshop in London in the mid 1990s. Yet I never got around to picking up a copy and getting on with it. Now that I have, rather than regret not having discovered it sooner, I’d like to thank my younger self for not reading it and allowing me to revel in the experience now. The book follows the author on a journey he made in 1933 (the year Hitler came to power) some forty plus years before he wrote it – walking from Rotterdam to Constantinople. From the introductory letter to Xan Fielding and the first chapter where the author recounts setting off from a rain-slicked London, it’s clear that this is going to be something special. ‘Paddy said to me: “It’s very good, but he ought to let himself rip.” Bruce said to me, almost simultaneously of Paddy’s book: “It’s very good, but it’s too baroque and overflowing; he should tone it down.”‘ – Under The Sun: The Letters of Bruce Chatwin, Elizabeth Chatwin and Nicholas Shakespeare. Leigh Fermor does pack a lot into his writing, but I don’t find it overly florid; rather it reads more as though he has such an urgent need to pass on what he has seen, thought and felt that he writes in a ultra-vivid prose poetry designed to capture as much visual and sensory detail as possible – so eager is he to share these recollections with his readers. This sense of breathless transcription may be in part because the author lost his notebooks on the way, so the later writing reflects an emotional effort to recall as much as possible and get it down on paper. The effect is to turn each page into a small treasury of shared reflection, knowledge and poetry. Throughout A Time of Gifts brims with external references and ideas from art, literature and history that are woven into the narrative, sometimes neatly, sometimes leading into expansive digressions. One amusing example is Leigh Fermor recounting his annoyance that Shakespeare gives Bohemia a coastline in The Winter’s Tale, before almost obsessively trawling through various private libraries and editions of the plays to try and work out why the playwright gave a coast to a landlocked country and discover whether the region did once contain land with a coast. It turns out, much to Leigh Fermor’s irritation, that unlike the History plays where Shakespeare was quite scrupulous regarding factual information, with the comedies he was a little more lax and in this case simply switched location from the original source tale – which was set in Sicily. Along the way many other topics and items of interest get drawn into the narrative, so as the author heads south and east, sometimes staying in Inns, or private houses at other times sleeping in barns, or rickety old sheds – we learn many, sometimes random things, about the places he passes through, along with related detours to discuss German castles, historic battles, architectural styles, local lore, heraldry, family histories, language and linguistics, Danube fish and river traffic, pretty girls, paintings and quotations from poetry and history. In this way, Leigh Fermor’s journey becomes as much a trip through time and culture as it is a long walk through middle Europe and on to the East. In one section, as he walks through Holland towards the German border, Leigh Fermor talks about how his perception of this landscape has been pre-determined by cultural influences at home, reflecting on how what he is seeing is in some ways a confirmation and expansion on the painted Dutch Landscapes he is already familiar with. I suppose today a more typical sensation like this might be a European visiting New York for the first time but feeling a powerful sense of second-hand recognition through the films and TV programmes set in the city they have watched back at home. 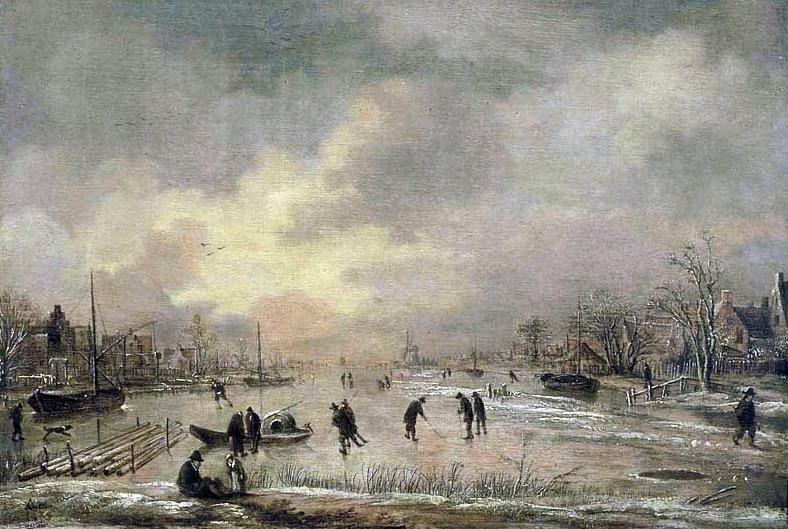 That said, Leigh Fermor’s descriptions of the Dutch landscape, invoked in me a kind of reverse desire, to go scuttling off to the Wallace Collection to drink in some of the winter scenes, canals, drunks, burglars, ice skaters and pastoral scenes by the likes of Aert van der Neer housed within. The real joy of reading the book is in Leigh Fermor’s depiction of the lands he passes through, managing to capture in magical, glistening prose, what’s particular and special about each place, town, city and region. An added, somber layer of meaning comes from the author and reader’s knowledge that everything being described, countries, peoples, ways of life, were soon to change utterly with the advent of World War II and the post-war transformation of Eastern Europe. There are long and evocative sections on the cities of Vienna and Prague – which alone make the book worth reading, but for me the stand out section is the Winterreise chapter, which sees Leigh Fermor make his way through Southern Germany during a cold dark winter. “ All was frozen. There was a particular delight in treading across the hard puddles. The grey discs and pods of ice creaked under hobnails and clogs with a mysterious sigh of captive air: then they split into stars and whitened as the spiders-web fissures expanded. Outside the villages the telegraph wire was a single cable of flakes interrupted by birds alighting and I would follow the path below and break through the new and sparkling crust to sink in powdery depths. The wonderful thing is that, passages like the above are threaded throughout the book. If you are interested in travel, landscape, poetry, history, good writing pick it up – there will be at the very least a line, a page, or chapter to treasure, but more than likely, you’ll find yourself enraptured by the whole thing. 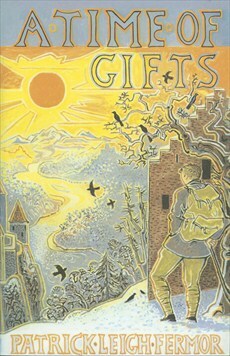 A Time of Gifts, Patrick Leigh Fermor, John Murray, 1977. Never a bad time in your life to read such a wonderful book and I loved the dense, rich prose. It is as you say a very poignant capture of a world about to be utterly torn apart and he captured that very aware of recording it with retrospect memory. This piece also reminds me that I still have the sequel on my shelves to read. And I am now itching to go out for a walk (even if it only is to the shops). Thanks. A wonderful book. I’ve got Between the woods and the water lined up next too. Apparently a third volume has just been published posthumously.